This is pretty awesome! Right now this Britta 7 Piece Comforter Set is $39.99 (Retail $100). 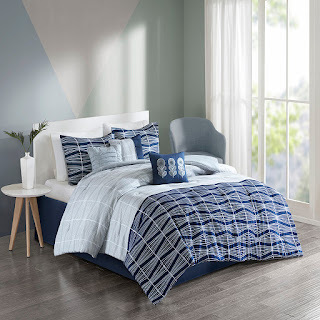 Update your bedroom with the beautiful colors of the Britta 7 Piece Comforter Set. The lovely comforter brings a fresh splash of color to your space, while also adding dimension and texture with its stylish design. The coordinating shams reiterate the pattern of the comforter and complement the color scheme of the top of the bed. Decorative pillows, featuring pleats and detailed embroidery, offer a charming touch to the bedding set. An included bed skirt provides a clean finish to complete the alluring comforter set. Due to the fabric pattern and varied color, the shams and 18x18 pillow may vary from the picture. Ends 6/3 or while supplies last.